It was 25 years ago to the day that the Sandinista guerrilla forces swept the Somoza dynasty from power in Nicaragua. Many in the country are celebrating, but questions are also being asked about what the revolution actually achieved. While there is now a flourishing democracy, and an obedient armed forces, the Nicaraguan economy is in tatters. 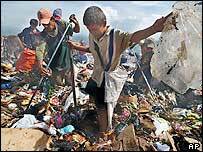 And the country is one of the poorest in the western hemisphere. Adolfo Calero rests heavily on his stick, and shifts around to ease the aching in his joints. He takes another cigarette out of the packet and tugs on it heavily. His rheumy eyes look out from behind thick glasses at an array of framed photographs on the walls of his Managua house. Mr Calero used to work as a manager with Coca-Cola. 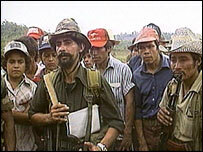 When the leftist Sandinista revolutionaries forced the Somoza dictatorship from power on 19 July 1979, he decided to take up arms. He became the commander-in-chief of the Contras. He was responsible for the funnelling of millions of dollars in aid from the Reagan government to some 20,000 soldiers under his command. Mr Calero points at one of the pictures, taken in 1984. It is of himself sitting opposite President Reagan in front of a fireplace. "That was in the White House. That's where he would receive Presidents and Kings. He gave us that status. I had enormous respect for him," Mr Calero says. When the Sandinistas took power, Mr Calero believed that it would result in disaster. As he stood in Managua's Revolution Square on this day a quarter of a century ago, he thought: "This is the end, this is chaos. I knew that they would make the Nicaraguan people in to guinea pigs for their socialist experiment." He points at the country's dire economic situation as a proof that his prophecies came true. "They denied private property and fought against private enterprise and fought Nicaraguan technicians out of the country. They were just like Fidel Castro in Cuba." Revolutionary fervour still burns within the current leaders of the Sandinista movement. Despite losing elections in 1990, and never having been voted back in since, they believe that they should be returned to power to continue their work. However, some party members became disillusioned long ago. Novelist Sergio Ramirez stands on a hilltop in central Managua outside the ruins of the Somoza dynasty's presidential palace. It was here that Sandino, the inspirational figure of the revolution, had his last supper before being murdered, apparently by agents of the regime in 1934. Mr Ramirez became vice president in the Sandinista government. He was also in the plaza 25 years ago, being cheered by thousands of Nicaraguans delighted that the hated Somozas had been toppled. 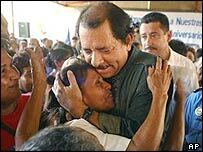 Driving in to the square on top of a fire engine alongside Daniel Ortega, he was greeted as a conquering hero. His face lighting up, he says: "It was perhaps the happiest day of my life. There was a lot of enthusiasm - the vision of the future was completely open. We didn't see any problems. The problems came afterwards." Mr Ramirez left the Sandinista party a decade later. 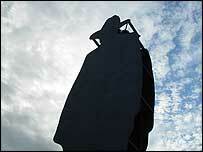 He looks up wistfully at the vast silhouetted statue of Sandino which gazes out over Lake Managua. "I think the problem was that we tried to apply to the country a socialist system which the country wasn't ready or prepared for," he says. "It is my only regret that the revolution didn't succeed in bringing to the country economic progress. The country is extremely poor now, and these are very sad circumstances."